Domestic shipments of Android-based smartphones declined year over year in the second quarter, while Apple saw its iPhone sales grow by 2 million units. The latest data from Strategy Analytics, released on Monday, reveals that Android's share of smartphones shipped in the second quarter of 2012 was 56.3 percent. Though Google's platform still has a majority of the market, its share was down from the 60.6 percent of smartphone shipments Android accounted for in the second quarter of 2011. Android's losses proved to be Apple's gain, as U.S. sales of the iPhone increased from 5.9 million in the second quarter of 2011 to 7.9 million in the same period in 2012. The research firm found that the iPhone accounted for 33.2 percent of all smartphones shipped in America in the second quarter of 2012. 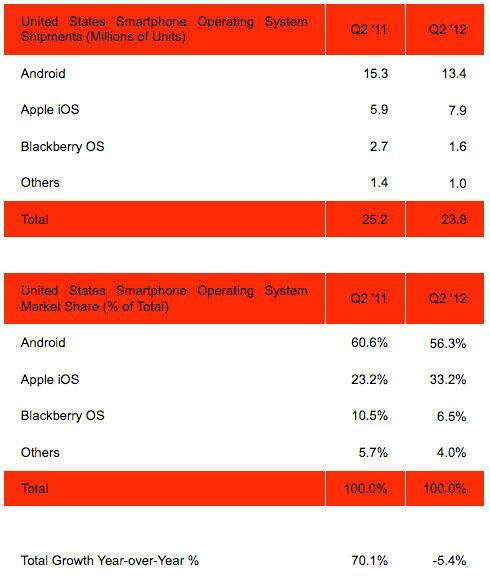 Strategy Analytics said the numbers show that Android's market share in the U.S. is peaking while Apple's iPhone continues to gain ground. Apple is expected to see it share of the market grow even more in the coming months, as the company is expected to launch a next-generation handset this fall. Also losing share in the second quarter was Research in Motion's BlackBerry OS, which slid from a 10.5 percent share in 2011 to 6.5 percent in the second quarter of 2012. In all, total domestic smartphone shipments were down 5.4 percent year over year over the three-month quarter. That's a major change from the 70.1 percent year-over-year growth the U.S. smartphone business saw in 2011. Strategy Analytics said the primary reason for slowdown in the smartphone market is a volatile economy, as well as maturing penetration of smartphones among mobile subscribers. In addition, the firm said major operators are tightening their upgrade policies to improve profits. Apple announced last week that it sold a total of 26 million iPhones in the June quarter, which was a 28 percent increase from the previous year. With 7.9 million of those sold in the U.S., a total of 3.7 million iPhones were sold through carrier AT&T, 2.7 million were activated at Verizon, while 1.5 million customers chose Sprint.